I began writing posts about my teaching plans and experiences because I thought it might contribute to demystifying our profession — and perhaps counteract, just a little bit, the way it is sometimes demonized (or ridiculed). I discovered after that first year that there were real benefits in this for me, and, not incidentally (if less directly) for my students, and so I’ve kept it up ever since (you can browse through the archive of posts here, if you’re interested). At this point, I’ve talked about pretty much all the courses in my regular teaching rotation at least once, but while there’s some repetition, I do vary the reading lists from time to time. And I’ve also strayed occasionally from straight-up reporting to broader reflections on different aspects of pedagogy or extended reflections on our readings, so for me at least that keeps the exercise interesting. Heading into my seventh season of this series, I have no specific ambitions or plans for it beyond keeping it up and seeing what arises from week to week. One of this term’s classes will already be quite familiar to regular visitors here as I have taught it literally every year I’ve been doing these posts, and that’s Mystery and Detective Fiction. I change it up a bit each time, and this year’s innovation is — finally! 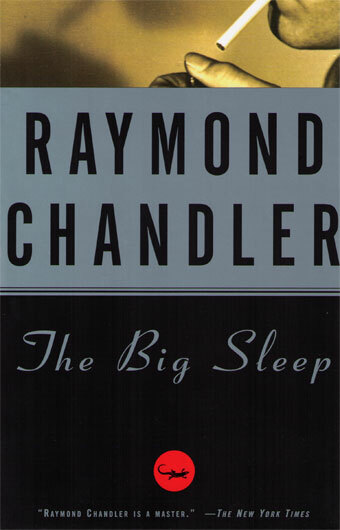 — switching to The Big Sleep from The Maltese Falcon. I’ve been thinking about this since at least 2009, when I read it and complained that I found it tiresome: “sexist, homophobic, convoluted.” Rereading this summer, I didn’t love it but I certainly appreciated it more (but yes, it is convoluted, and I’m also still pretty sure it is sexist, though I’ll invite debate about that in class when we get there). The only other tweak is that I’ve cut most of the short fiction: students often remark in their evaluation that there’s a lot of reading in the course, and this allows me to stretch out our time for some of the novels a bit more without losing anything that makes me particularly sad. Today we talked about “The Murders in the Rue Morgue,” and Friday we begin discussions of The Moonstone. Yes, I always reread it — though at this point I do sometimes skim selectively. I almost never get caught out on a detail I’ve forgotten! My other class this term is The British Novel from Austen to Dickens. I’ve taught this class pretty regularly in recent years but I haven’t assigned Waverley since before I started blogging. I stopped assigning it because the students were so petulant about it in their evaluations — most of them, I should say, as there were always a few who really got it and loved it. We’ll see how it goes this year: it may well provide fodder for a post or two. The other big change is bringing in David Copperfield as my Dickens option: in previous incarnations of this class I have done Hard Times, Great Expectations, A Tale of Two Cities, or A Christmas Carol. It’s our only really loose baggy monster, and it does come right in the middle of term, but I’ve tried to allow enough time for it in the schedule that it won’t kill us all — or kill everyone’s enthusiasm for the class. I’m sure they’ll love it. How could they not? Right? Please? Right now we’re working our way through Persuasion and as far as I can tell they’re keeping up and appreciating it. I always enjoy reading your posts on teaching (in addition to enjoying all the other ones, I mean!). I’m afraid I would be one of the ones who doesn’t appreciate Waverley. I understand that this is probably my failing. I need to give Scott another chance at some point. Rebecca, I’m sure I would not appreciate it as much as I do if I hadn’t worked with Harry Shaw at Cornell: he’s a great advocate for Scott’s peculiar brand of genius! The students who end up liking it are usually won over by realizing that it’s a very funny novel. I usually advise them to keep track of how many times “our hero” trips, faints, or otherwise is incapacitated as he’ wavers’ around the different loyalties in the book. And I tell them that it’s actually OK (IMHO) to skim the Baron of Bradwardine’s boring speeches provided you think a bit about why such a boring windbag gets so much air time in the first place. Heart of the Midlothian (as you well know) and Waverley are the only two books by Scott I’ve read. Where to go next? Dorian, I thought Ivanhoe was excellent! Rohan, I also really enjoy your teaching posts. They make me wish I were an undergraduate English student again! I think Old Mortality is another one worth reading, but after these ones we’ve mentioned and Redgauntlet and The Antiquary, that’s about it for me too! I think “The Two Drovers” may be the most teachable Scott I know. The Antiquary readalong, now that was a book blog classic. For advanced Scott students only. “The Two Drovers” is really interesting and surprising. I would not have read it without Rohan’s recommendation. Almost an early proto-mystery, a crime story. I read Waverley as my commute novel during my 1st Undergrad year. I actually love Scott – all Waverley novels & his later works. My ultimate fav has been Heart of Midlothian. I am surprised (but I shouldn’t) about English lit students complaining about the volume they have to read. Isn’t that the point?? Especially in a course of 1st half 19th Century novels. I feel a little like a freak – my biology dept was comprised of a number of ex Oxford/Cambridge/Harvard alumni so they made us read all the seminal papers in our courses. On top of that I squeezed my hobby of English lit novels as commute reading (I did have a 2 hr each way commute). I consumed as many of the world’s literature as I could in those 3 yrs & have never regretted it. I have often thought of doing a BA as a hobby, but sadly work continues to prohibit that. I must live vicariously thru blogs like yours. “Advanced Scott students only” — ha! When the A+ student in the group is Woolf, you know you’ve got something to prove.